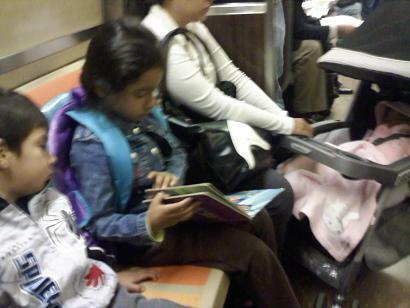 I love watching people read when I take the subway to work every morning. It gives me hope for the future. You see a wide variety of reading materials on the R train. Many languages, many formats, cheap novels, literary novels, lots of bibles and other religious literature, history books, tabloid reports of the day's tidings. Everybody is engrossed. 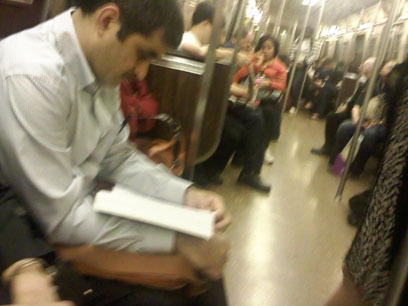 As near as I could tell, this guy was reading a C# software development guide. 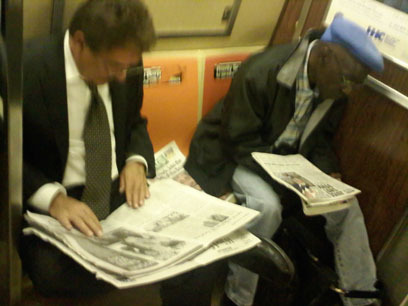 These guys, who did not appear to know each other, had constructed a pile of newspapers to read from in their corner. These kids have never seen a litblog. They don't know who won the Man Booker Prize and they don't care. But I watched this Mom hand her restless daughter a book, and I saw how eagerly the little girl began reading, her younger brother clamoring to share. Why despair of the next generation? 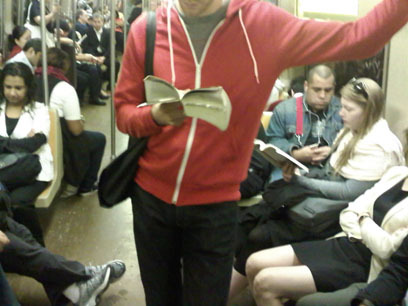 Yeah, people read on trains in New York City. At least I know they do in Queens. 9 Responses to "The Reading Room"
I wish I could read my way to work on I-95 in Miami.... Better yet, not having to drive!!!! I am a firm believer that travel time=reading time, including the time it takes me to walk to the tram/bus stop. For some reason, it's not as normal in Germany and people stare at me. Friends who have seen me reading while I walk have commented on how funny it looks, but I don't know why. If I were to drive, I would be wasting my time. Here I'm getting something done and getting somewhere. :) Reading unites people. It makes people better. Nice concept, Levi. This is great. I ride a city bus to work every day and I quite enjoy reading on the bus and walking from the bus station to my place of employment, and in the evening, from the bus stop to my house. I purposely live in big cities and take public transportation, just so I have plenty of reading time (and don't have to depend on a car). I have read literally hundreds of books while on the "L", the subway, the métro, the tube. I prefer the train to the bus, by the way. 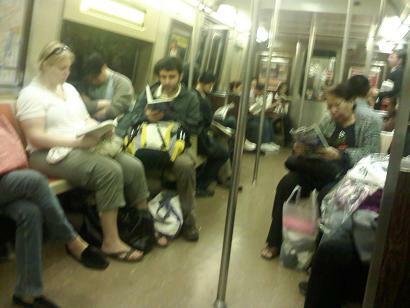 Here in Boston, I think fewer people read on the subway than in your pix, but read they do - Chinese bibles, newspapers, educational materials (this is a huge university town), cheesy novels, literary, the works. A woman next to me was reading a Sony Reader and several people asked her about it in the space of a few minutes (she loves it). Yeah, the train beats the bus for reading any time - the smoother ride does the trick. I often take the bus from Boston to NYC and do read, of course, but it's harder on the eyes and brain. Aren't audio books getting bigger as well? I just heard my first audio short story, about an Army deserter by the author of The Man with a Golden Arm and really enjoyed it! I always thought that I wouldn't be able to keep track but it was easy. I always have something to read. If I don't, I must wait. I recently rediscovered the joy of reading on transport and marvelled at how much more spare time I had to simply *read* after I had bungled my car. hey i'd love to read on my transport to work. but my commute is on a bike, still though i can read for half the day at work, and have read hundreds of books while at work in the last 10 years. oh the commute is a 15 minute bike ride along the secenic seashore, so it puts me in a mood for some reading.